Optical coherence tomography (OCT) was introduced in 1991 and made possible the quantitative measurement of retinal thickness. In 2002, time-domain OCT 3000 (Stratus OCT, Carl Zeiss Meditec) became available with an axial resolution of 10 µm and a scan velocity of 400 axial scans per second. Although time-domain OCT is currently the most widely used system for posterior segment retinal tomography, higher resolution spectral-domain (SD) OCT has entered clinical practice since 2004 and is increasingly employed in the diagnosis and management of age-related macular degeneration (AMD). SD OCT technology uses low coherence interferometry to detect light echoes, relying on a spectrometer and high-speed camera and based on the mathematical formula of Fourier transformation. As the physics behind this technology is non-proprietary, unlike time-domain OCT, there are currently several different posterior segment SD OCT systems commercially available. 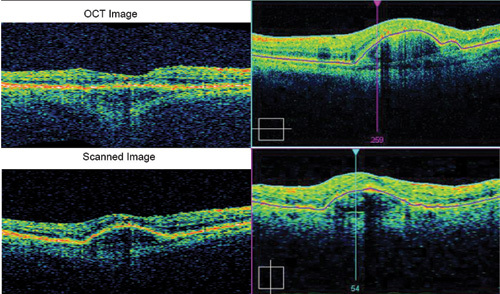 This article provides a brief review of several SD OCT systems and how they may assist with the management of patients with AMD. Cirrus OCT (Carl Zeiss Meditec, Dublin, CA) is a SD OCT platform that has a 5 µm axial resolution and scans at 27,000 A-scans per second. The current software for Cirrus allows side-by-side viewing and macular change analysis over several consecutive examinations to highlight changes, for example, after an intravitreal injection of an anti-vascular endothelial growth factor agent. The current software also includes a unique pigmented epithelial detachment mapping program for following up patients with large deposits of drusen.1 Cirrus OCT is also polarization-sensitive and has been used to identify and characterize typical retinal pigment epithelial (RPE) findings in patients with AMD. In one study, investigators were able to identify functional RPE within disciform scars; these investigators concluded that identifying the status of RPE might help estimate the functional prognosis of patients with AMD, and determine whether further treatment has the potential to benefit either visual or anatomic outcomes.2 Figure 1 demonstrates comparison of time domain Stratus (left) to spectral domain Cirrus (right) in a patient with exudative AMD. Although the raw scan correctly detects a choroidal neovascularization (CNV)-associated pigment epithelial detachment (PED), a software algorithm processing error falsely flattens the image on the Stratus, whereas both the Cirrus vertical and horizontal scans clearly demonstrate the PED. Spectralis (Heidelberg Engineering, Vista, CA) combines a scanning laser ophthalmoscope (SLO) with OCT to produce tracking laser tomography that has a 7 µm axial resolution and scans at 40,000 A-scans per second. One beam constantly images and tracks the fundus and acts as a reference, guiding the second beam of light to position the cross-sectional OCT scan precisely. This real-time eye tracking enables a highly repeatable alignment of OCT and fundus images. One group reported that choroidal thickness can be measured using Spectralis OCT with enhanced depth imaging by positioning the device close enough to the eye to acquire an inverted image within a 5-30 degree area centered at the fovea and then performing manual measurements from the outer border of the RPE to the inner scleral border.3 In separate reports using the same technique, these investigators also reported enhanced depth imaging of choroidal changes underneath a PED in patients with exudative AMD, and described a novel disease entity termed age-related chorioretinal atrophy.4,5 Figure 2 demonstrates a false-color 3-dimensional volume cube scan of a PED resulting from CNV between black-and-white fluorescein angiogram images, (top) and a cross-sectional slice of a PED resulting from CNV in another patient with neovascular AMD (bottom). OCT has become a valuable tool for ophthalmologic clinical and surgical decision making. However, the variety of systems available, as well as different scanning patterns for each, makes comparison of data problematic. For the majority of clinical applications, for example, assessing for the presence of macular edema due to CNV, we have found that the macular cube, radial or raster pattern scan of each device is sufficient for efficient and definitive diagnosis. However, we recommend using higher resolution scanning when available, since in our experience, it can help detect smaller, more subtle areas of intra- or subretinal fluid which may influence treatment decision-making. We reported previously that in patients with macular pathology, there are no clinically significant differences in retinal thickness measurements between Cirrus SD OCT 512 by 128 and 200 by 200 macular cube scans.12 When comparing one SD OCT device to another SD OCT or time domain Stratus OCT, we recommend using the same scanning pattern for each device which may allow relative comparison among patients scanned on different machines at different time points, although machine-to-machine comparison of quantitative macular thickness measurements is not practical due to a difference in outer boundary reference points of each device. Kiernan DF, Hariprasad SM, Mieler WF. Spectral Domain OCT: A Comparison of Modern High Resolution Retinal Imaging Systems. Am J Ophthalmology. 2010;149(1): 18-31. Margolis R, Spaide RF. A pilot study of enhanced depth imaging optical coherence tomography of the choroid in normal eyes. Am J Ophthalmol. 2009;147(5):811-5. Spaide RF. Enhanced depth imaging optical coherence tomography of retinal pigment epithelial detachment in age-related macular degeneration. Am J Ophthalmol. 2009;147(4):644-52. Spaide RF. Age-related choroidal atrophy. Am J Ophthalmol. 2009;147(5):801-10. 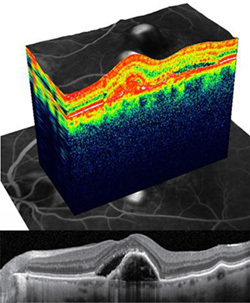 Menke MN, Dabov S, Sturm V. Features of age-related macular degeneration assessed with three-dimensional Fourier-domain optical coherence tomography. Br J Ophthalmol. 2008;92(11):1492-7. Mojana F, Cheng L, Bartsch DU, et al. The role of abnormal vitreomacular adhesion in age-related macular degeneration: spectral optical coherence tomography and surgical results. Am J Ophthalmol. 2008;146(2):218-227. Toth CA, et al. IOVS 2008;49:ARVO E-Abstract 5394. Schuman SG, Koreishi AF, Farsiu S, et al. Photoreceptor layer thinning over drusen in eyes with age-related macular degeneration imaged in vivo with spectral-domain optical coherence tomography. Ophthalmology. 2009;116(3):488-496.e2. Sayanagi K, Sharma S, Yamamoto T, Kaiser PK. Comparison of spectral-domain versus time-domain optical coherence tomography in management of age-related macular degeneration with ranibizumab. Ophthalmology. 2009;116(5):947-55. Department of Ophthalmology & Visual Sciences, Chicago, IL. Ophthalmology and Visual Sciences, Chicago, IL.